The Southern California desert destination of Joshua Tree National Park and nearby Pioneertown is attracting a combination of trendy jetsetters, free spirits and adventure seekers alike, out in search of solitude and wild terrain. While you may not think of the high desert as a luxurious travel spot (I sure didn't), I'm here to open your eyes to all that there is to do in Joshua Tree that goes way beyond anything you'll find in a hotel lobby or fancy golf course. Even though Joshua Tree is less than a 3 hour drive from Los Angeles and San Diego and not even an hour from Palm Springs, when you're here you feel about a million miles away from anything resembling city life. After taking my first desert vacation, I was blown away by all of the interesting activities, surprisingly good food options and stunning views and I knew I had to share it. A car is absolutely necessary when visiting Joshua Tree as it's really the only way to get around. Most of the year this area is warm, sunny and dry during the day; however, depending on the time of year you're visiting, nights can get rather cold and it can even snow. Don't forget to pack good walking/hiking shoes because this is one place you'll want to get out and explore. If you're wondering where to stay for a desert vacation, I recommend skipping the hotels and booking one of the many unique vacation rental homes that are located far away from the city lights so you can be surrounded by peace and quiet. I was struggling to find the right place until I found my perfect retreat on GlampingHub.com. GlampingHub specializes in unique rental properties (everything from fancy tents to grand estates) in more remote areas so that travelers like me can still enjoy nature without having to climb out of a sleeping bag (they get me!). Anyway, that's how I found The Olive Adobe, a rustic-chic 3 bedroom private house that feels a world away from civilization on 7 acres of private land, without actually being all that far away. The Olive Adobe is found in that perfect sweet spot somewhere between totally remote and close to everything. Its location feels relatively remote, with only a few homes nearby and unique hiking trails available just a few streets away, while still being no more than 30 minutes from anything you'd want to see or do. 10 minute drive: Pioneertown and Pappy & Harriett's. 20 minute walk/5 minute drive: Easy Hike to Petroglyphs. 30 minute drive: 29 Palms & Joshua Tree National Park. 15 minute drive: Yucca Valley, a larger city with everything from fast food and grocery stores to antique stores . The Olive Adobe is a fully equipped, 3 bedroom, two bathroom home with every detail in mind to ensure guests have a spectacular, comfortable stay. There are two bedrooms with queen beds and the master has a king bed, each with their own private entrance. Every room in the house is uniquely decorated to highlight the location and the home owner's world travels, like the wall of hats that hang behind the antique heater and the collection of vintage fly fishing poles that are from the owner's childhood. The kitchen is fully stocked with all of the necessities to make and serve a full family meal (including accompaniments like salt, pepper and olive oil) and since there are grocery stores less than 15 minutes away, stocking up on ingredients is easy. There is also an espresso machine and coffee maker, so there's no need for a Starbucks run. One of my favorite touches is the beautiful, classic record player and speaker system that even has a port for your iPhone so you can play your own music. In addition, the light and air that flows throughout the house is magnificent - you can literally open nearly every wall of the house to ensure a constant fresh breeze. Furnished and equipped with a very high attention to detail, it's one of those homes that you can come in with nothing and have everything you need right there waiting for you. Quick Note: This is not the best house for kids as there are so many delicate works of art, including some more "adult" pieces that might not be suited for little ones. So consider The Olive Adobe as a mature, luxury retreat rather than a family vacation home. The real gem of The Olive Adobe is the outdoor oasis that has been meticulously formed to guarantee that guests feel at peace. The entire house is surrounded by an adobe wall, creating a sense of total seclusion from the outside world, while inside those walls you hear the sound of running water from the fountain, watch the sun peek through the branches of the olive trees, lounge by the "secret" garden with a book or simply gaze up at the stars while laying on the rooftop bed. If you're feeling really adventurous, there's even an outdoor shower for those who really want to be one with nature. There are so many hidden pockets to sneak away that even with the house full of people, you can easily find a place to yourself. We found ourselves eating every meal at the large outdoor dining table or eating cheese and sipping an evening glass of wine in front of the wood fireplace. I even found my husband asleep in the porch swing more times than I like to admit. It's safe to say we spent very little time inside. When you step outside the walls onto the 7 acres of private land, you find even more to enjoy, like the bocci ball court and the mountain views that seem to go on for days. And don't forget to tilt your chin towards the sky at night because the stars are unbelievable. If you're a city girl like me, it's rare to see anything more than a few slow moving dim dots of light when you look into the night sky (yes, I know those are airplanes, thank you), so when you're showered by a party of glitter each evening, it's pretty incredible. I actually took my first star photos here and while I've still got a lot to learn, I couldn't have asked for a better backdrop for my initial attempt. With all of that said, the Olive Adobe would simply be a beautiful vacation rental in the desert if it weren't for the warmth and hospitality of the owner, Peter, who is truly what makes this place so special. He has a real love for the area and a passion for sharing it with others, putting care into every detail of a stay for his guests. As a professional architect, he truly has an eye for quality and detail, which can be found throughout his home, including making sure that guests have recommendations for everything from local hikes to nearby eateries. Peter is a true Type-A host, who even set out printed copies of our weekend's activities next to a bottle of wine on the counter for us to find when we arrived - a man after my own heart! If you get the opportunity to chat with him during your stay, you'll find yourself in great company. Pioneertown is one of the main attractions of the Joshua Tree area for its ability to take you into an alternate universe of the wild, wild west. This little strip of desert once served as the set more than fifty western movies of the 1940s and was created to bring visitors close to the movie magic on the outside, while still having practical interiors like souvinir shops and candy stores. As you walk through this little movie town, you can literally picture John Wayne riding up on his horse and battling in a shootout in the middle of the road. But no visit to Pioneertown would be complete without a visit to Pappy & Harriett's Pioneertown Palace for incredible live music and great food. Pappy and Harriett's is a major staple of this area and people travel from all over to grab tickets to a weekend show and often wait for over an hour to grab a seat to eat some of their delicious bbq. Tip: If you have tickets to a concert and want a dinner table that you'll have throughout the concert, make reservations as early as possible for any time after 7:30pm. Just minutes from the Olive Adobe is an easy and breathtaking hiking area where you can find petroglyphs drawn on boulders and carvings in the rocks. This is a lesser known hike, which makes it so special because you'll rarely see anyone and it remains relatively untouched. The views are spectacular and it's relatively flat so that anyone can do it. Directions: From Acacia Avenue, turn right on Boulder View Dr. and proceed for about a mile. Across from a small brown cabin on the right (the second from last house) near the end of the road, you will see a trail head on the left, and a place to turn out and park. Walk up that trail and on the first boulders you come to on your right -- about a 10 minute walk -- you will find incredible petroglyphs on the boulders. Also look for the bedrock mortar -- a bowl carved into the rock. Continue on through the canyon for one of the most beautiful hikes you have ever seen! If you're looking for a truly unique desert experience, there's none more incredible than a private hike with a falconer. I had personally never heard of falconry, but came to discover that it's the sport of hunting with trained birds of prey. Our host from The Olive Adobe helped us to book an early morning hike with Lorrie, a local falconer. He met us at the house with three of his trained harris hawks and he spent the first hour introducing us to the birds and teaching us about falconry. Each of us were given the opportunity to hold the hawks, which was an unreal experience. Staring into the eyes of these majestic creatures makes you realize just how powerful they really are. Wow - that's really all I can say. We then left the house and drove to a nearby trail where Lorrie let the hawks out and we followed them as they hunted for prey - rabbits, squirrels, rats, snakes, etc. As we walked, Lorrie told us more about the area, his passion for educating people about these animals and the importance of sustainability. The time we spent with Lorrie and his birds is one we will never forget and I can't recommend it more. Of course, Joshua Tree National Park is the main attraction that draws visitors from all around the world to the Southern California desert. It's surprisingly serene and the views continually change as you move through the park. There's really something for everyone, including me, who was never really a desert lover, but over the last few years I've started to really appreciate the natural beauty it holds. It's worth scheduling at least a half day through the park, but a full day is best for some longer hikes. There aren't any facilities to get food when inside the park, so pack a lunch and lots of water. I recommend starting on the 29 Palms Side then driving west through the park to end near Yucca Valley. The views on the west side are the best so if you can schedule your time to be there around sunset, you won't regret it. Pappy and Harriets is probably the busiest place in town and is well known for their bbq. I can tell you that the mac and cheese is some of the best I've had and the ribs are fall off the bone tender. Make a reservation if you can so you can skip the crazy line, but if you don't have one you can expect to wait around 30 minutes to an hour on weekends. This probably doesn't sounds like a likely place to be on this list, but the Joshua Tree Hookah Lounge is a highly rated Mediterranean restaurant in Yucca Valley. While the name suggests that it is a hookah venue, there's actually an entirely separate area for that so there's no one smoking in the restaurant - which is large and super clean. The food is fresh and delicious and really well priced. I highly recommend getting the Gyro Shawerma Plate that comes with rice, bread, salad and hummus. Their baklava is also sinfully good so don't expect to share. The only negative to this place is that service is not all that friendly and they seem annoyed that you are even there - but it won't stop me from coming back again! La Copine is by far the nicest restaurant we went to in Joshua Tree. This trendy establishment is in a random spot right off of the main road (Old Woman Spring Road... that's literally what the street is called), and is clearly the town's date spot and is popular with the LA hipster crowd. The menu focuses on American fusion focusing on fresh, seasonal ingredients. They are only open Wednesday through Sunday from 2 to 7pm and they don't take reservations so you'll need to get there early if you want a table before they close. Even arriving around 5pm there was about a 20-30 minute wait so plan accordingly. I recommend ordering the fried chicken, it's crispy while still being moist and has a drizzle of sweetness and I also suggest ordering a cup of hot golden milk for the end of your meal since it's super unique and I've never actually seen it served at a restaurant before now. 29 Palms Inn is a unique spot for lunch or Sunday brunch and is just outside the East exit of Joshua Tree National Park. In addition to having delicious food, the grounds of the inn are worth exploring and have a hidden oasis surrounded by palm trees literally has a tug boat in the middle of it. Also check out the gigantic garden, it's pretty impressive. There's so much to do and see in Joshua Tree and I hope you get to enjoy it as much as I have. 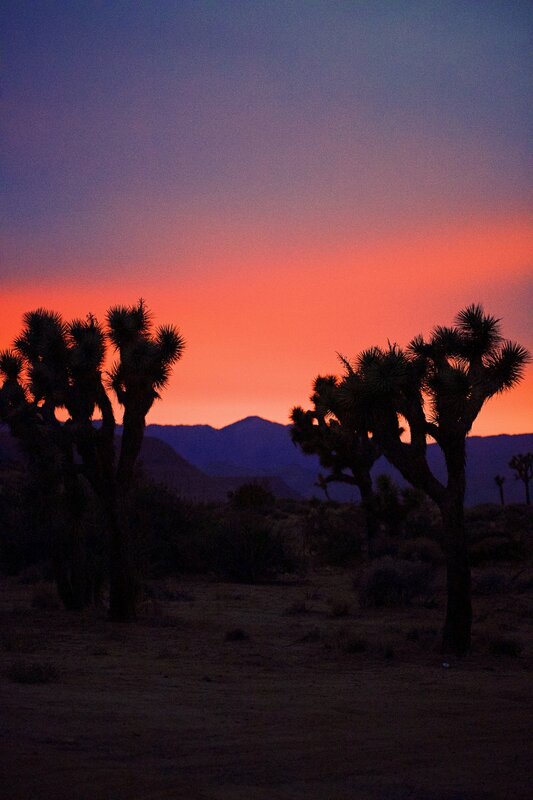 But before you leave, sit back and watch the sky come alive during an epic desert sunset. Happy travels! If you have any questions, comments or additional tips you think I should add to the guide, you can leave them on the blog by clicking here. I look forward to hearing from you!